The world will fail to reach millennium development goals unless India improves its record on health and child protection, a UN report says. Unicef, the UN children's agency, says India is failing to provide basic healthcare for its poorest children - despite robust economic growth. India and China account for nearly a third of the world's child deaths, the vast majority of them in India. The country had 2.1m child deaths in 2006 - more than any other state. The corresponding figure for China was more than 400,000. The Unicef report examined the latest trends in child and maternal health in Asia. It said the region's robust economic growth had lifted millions out of poverty, but deepening disparities between the rich and the poor had meant that health care often failed to reach those at the very bottom. "It is a "fundamental truth" that unless India achieves major improvements in health, nutrition, water and sanitation, education, gender equality and child protection, global efforts to reach the millennium development goals (MDGs) will fail," Unicef says in the State of Asia-Pacific's Children 2008 report. The divide between rich and poor is rising at a troubling rate in the region, the report says. "This is leaving vast numbers of mothers and children at risk of increasing relative poverty." Unicef recommends that both countries increase spending on public health by at least two per cent while also involve communities in order to strengthen the system. Unicef says avoidable diseases like pneumonia and diarrhoea and a high rate of malnutrition are the major causes of child death in the region. 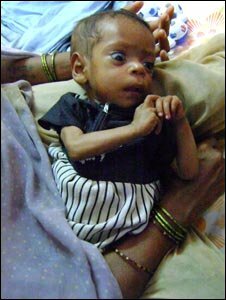 The report says that in India "one out of every three women is underweight which puts them at risk of having low birth weight babies. These babies are 20 times more likely to die in infancy than healthy babies". Experts say poverty, ignorance and poor feeding practices often result in high rates of malnourished children. Rising global food prices in the last few months have also had an impact. The report says the gender discrimination prevalent in South Asia ensures that life expectancy of girls is lower than boys. In Pakistan, boys are more likely to be immunised than girls and have better access to health care, says Unicef. Conflict also affects a child's chance of survival and Pakistan and Afghanistan are two countries in the region where children have to struggle hard to survive, the report says. However, Sri Lanka - which has one of the longest running civil wars in the region - has managed to cut down on child deaths by half since 1990 because it has emphasised on health care, Unicef says.